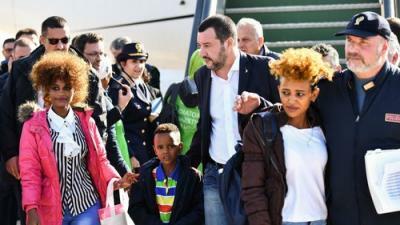 ROME - Minister of the Interior Matteo Salvini arrived at Pratica di Mare Airport on Wednesday to greet 51 migrants. Their transferal was made possible by the formation of a humanitarian corridor between Niger and Italy, set up with the assistance of the Pope John XXIII community. The minister mounted the plane’s steps to greet the new arrivals, 31 of whom are Sudanese, nine Ethiopian, six Eritrean, four Somalian and one Cameroonian. Among the migrants, 15 are reported to be refugees, and 36 asylum seekers. They will be looked after by the Pope John XXIII community. The migrants had been living in Libyan detention centres for some time before the U.N. Refugee Agency (UNHCR) described them as vulnerable and demanded their transferal to one of the UNHCR buildings in Niger. A humanitarian corridor between Niger and Italy was then set up, enabling them to move to the country. However, the timing of his decision to welcome them under the glare of the media spotlight was viewed by onlookers as suspicious, for just last Saturday he came under fire after harshly criticising Maltese authorities for helping migrants reach Lampedusa. “I’ve had it up to here with the rest of Europe treating Italy like a refugee camp,” he announced. The following day, Salvini travelled to Naples to take part in a local council meeting. His arrival stirred up tension between police and protestors, as representatives from left-wing group ‘Insurgencia’ protested the Deputy Prime Minister’s visit. 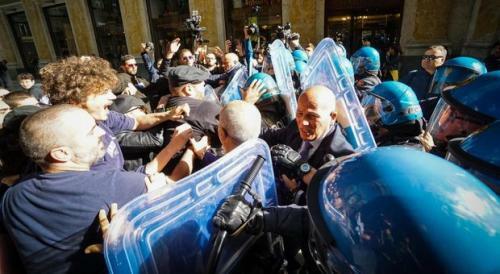 They were arrested following attempts to break through the police cordon set up outside the Prefecture, the building where the meeting was being held. One person suffered major bleeding after reportedly being hit on the head with a baton. After the meeting, Salvini said he had received “an extraordinary welcome” in Naples, adding that “they told me there were the usual idiots…causing trouble.” The controversial leader of the League party also told sources that part of the meeting was focused on stiffening punishments for crimes linked to drugs. “I will present a bill that will increase the current sentences five-fold,” Salvini said. He also added that he would be returning to the city "every month."